We are looking for exceptional volunteer groups to travel to the Cheyenne River Sioux Tribe Reservation in South Dakota. Being a volunteer on the Cheyenne River Reservation is about bringing hope to a place that has been marginalized for generations. You will become allies. You will become partners. Through youth development and community building programs, you will create smiles where there is often little reason to smile. You will ease the burden and alleviate the suffering. You will allow an adult to forget their worries and for a child to just be a child. The holistic nature of the Simply Smiles approach is proving to be the only effective means of changing life on the Reservation. Your presence in this complicated, tragic, and beautiful place is nothing less than vital. Join us on the Reservation. Create smiles. Begin your education. Help make real and lasting change. Watch an overview presentation about the Reservation volunteer experience. Click on the thumbnails below to download. From the time I signed up, to the day I flew back home, the staff could not have been more helpful, encouraging, and unbelievably inspiring. The warmth, welcoming & great heart, and spirit of the staff will always stay with me. The beauty of the Lakota people will as well. One of the beautiful things about Simply Smiles is its capacity to bring people together, not only in its areas of operation but also through volunteering. Being on the Reservation and meeting members of the communities brought a new understanding of what connection means at its core. Where is the Cheyenne River Reservation? The Cheyenne River Sioux Tribe Reservation is located in South Dakota and is roughly the size of Connecticut. Simply Smiles is based in the town of La Plant, which lies on the eastern half of the Reservation. La Plant is about 3.5 hours northeast of Rapid City and about 1.5 hours northwest of Pierre, South Dakota. This is a safe and established volunteer experience for those ages 15 and up. Simply Smiles has been hosting volunteers since 2003 and our dedicated staff will live and work with you 24/7. Simply Smiles is part of the Reservation community. The families of the Reservation want Simply Smiles as part of their town and their lives. This partnership makes what can be a volatile place like the Reservation an acceptably safe place for us to work. Safety is our first concern and the deciding factor in all we do. What are the available dates for a Simply Smiles Service Trip? Simply Smiles offers service trips to the Reservation from May through August. We recommend you book your service trip as early as possible, as popular weeks do fill up fast! Click here to jump down the page to see available dates. What type of work will our group be doing? Your time volunteering on the Reservation will be focused on sharing your attention, energy, talents, and experiences with the children. Through your presence. Your presence shows the children and their community they are loved and cared for. Through the activities you provide for our youth programming. You will help to run activities for the children: crafts, games, field trips, special theme events like “superhero week,” and much more. Through your commitment to community building. You will work side by side with Simply Smiles staff members to execute a variety of community programs that bring people together including: sports tournaments, community meals, cooking classes, and more. We will work with you to plan a week of programs that utilizes your group’s expertise, skill set, and talents. Volunteers stay on the grounds of the La Plant Community Center, where they live and work side-by-side with the staff. 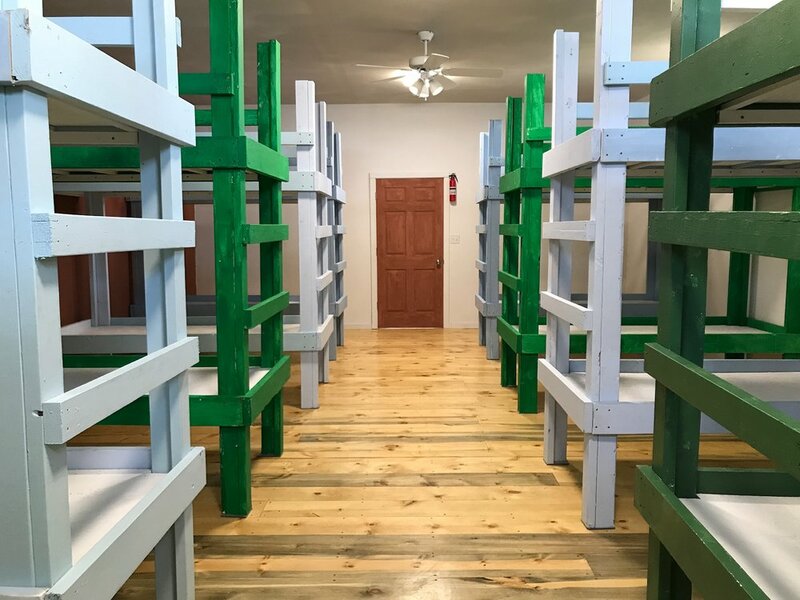 Sleeping: Volunteers sleep on bunk beds in a volunteer bunkhouse. You will need to pack a sleeping pad, a sleeping bag, and a pillow. Bathrooms/Showers: Volunteers use pit latrines at the Community Center. There is an outdoor spigot and a hose with clean, running water, but there is no sink on site. Be prepared to go a few days without a full shower. Food/Water: With the staff, volunteers help prepare the week’s meals, and everyone will eat together. Drinking water is provided. Electricity: There is electricity with standard U.S.-style outlets. Communication: There is limited cell phone reception on the Reservation. Is there an age minimum for volunteering? Age maximum? 15 years of age (by arrival date) as part of a contracted volunteer team. Volunteers traveling independently must be at least 18 years old (by arrival date). There is no maximum age, but our volunteers should be aware of the physical demands of the Simply Smiles service trip experience. Volunteer Expense: Each volunteer makes a $750 contribution to Simply Smiles in order to help cover the expenses associated with your time volunteering on the Reservation. 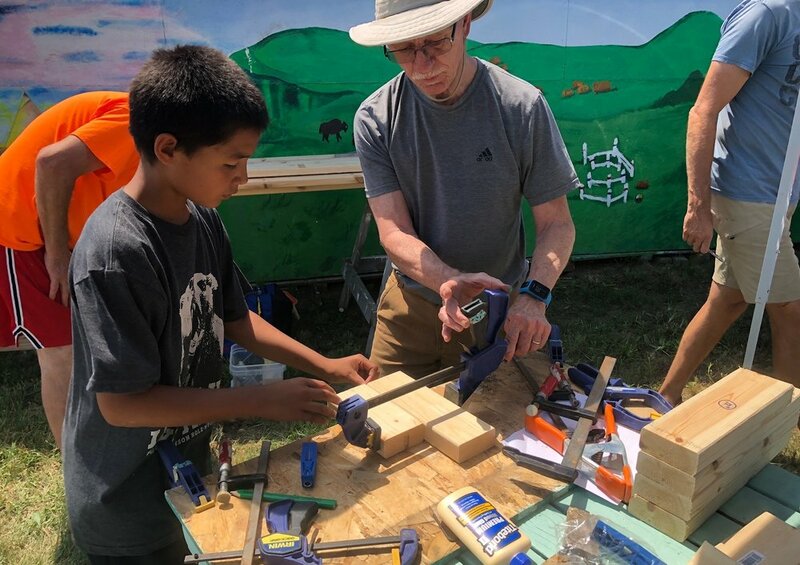 Your volunteer fee covers: your lodging, your meals, building project materials, all program-related costs, your transportation while on the Reservation, and 24/7 on-site staff support. Airfare: Airfare costs are determined by your departure city, of course, but as an example, roundtrip airfare from the New York City airports to Rapid City, South Dakota (airport code RAP) is generally in the $500-$800 range. Service trip groups fly into the Rapid City Airport (airport code RAP). The Simply Smiles staff will pick your team up at the airport in our vehicles and together we’ll head to the Reservation — a journey that takes approximately 5 hours, including stops. It is also possible to drive to the Reservation in a personal or rental vehicle. You will coordinate your arrival/departure with Simply Smiles. How do I book a week-long Simply Smiles Service Trip? Volunteer Coordinator Jasmine Martier on the Reservation. Confirm with Volunteer Coordinator Jasmine Martier that your desired time-frame is available. Jasmine will send you a link to the contract and deposit information. Once you have submitted both your contract and deposit your trip is booked and we’ll send you a login for your trip planning webpage. If you are not ready to book, but would like to “pencil in” a week, please let Jasmine know and she’ll note you as an interested party for a week (or weeks) with no commitment on your part. Are there references I can talk to? Kareem is the Director of Service Learning at Sacred Heart University and hosts an annual service trip for undergraduate students to the Reservation. Eleanor is an ordained minister in the United Church of Christ and leads an annual youth and adult service trip to the Reservation. I want to volunteer as an individual, but I don’t have a group. What are my options? 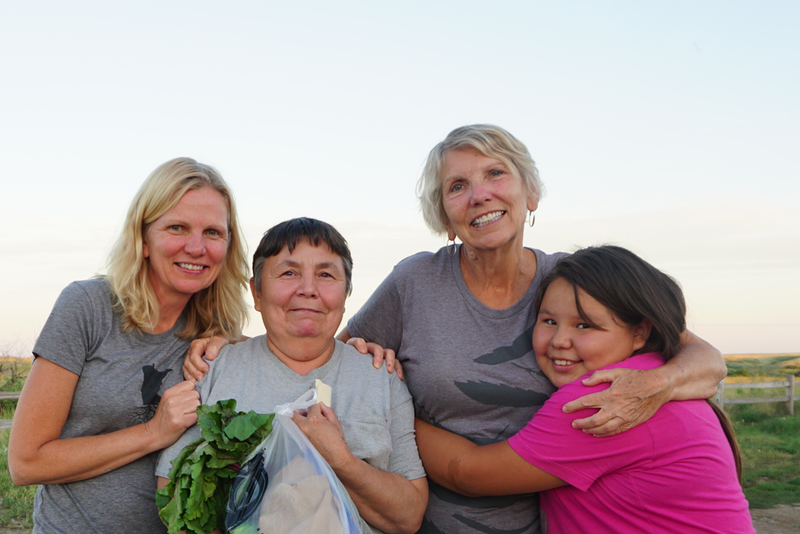 We host volunteer groups from May to August on the Reservation. Most of these groups come from institutions like universities and churches. However, very often, there is space for an individual volunteer like yourself to join one of these teams. If you are interested in volunteering as an individual, please reach out to our Volunteer Coordinator Jasmine Martier. interested in volunteering with Simply smiles? start your journey. LiveChat with us! Chat with us, Monday through Friday, 9AM to 5PM EST, by clicking the chat window in the bottom right-hand corner of this page. We host groups on the Reservation from May through August. Learn more about our special partnership with the U.C.C. We welcome LGBTQ2+ volunteers and are committed to an inclusive, safe, and diverse Simply Smiles community. Who will our volunteer group be helping? Volunteers participating in a Simply Smiles service trip to the Cheyenne River Reservation in South Dakota will be supporting Lakota children and families. 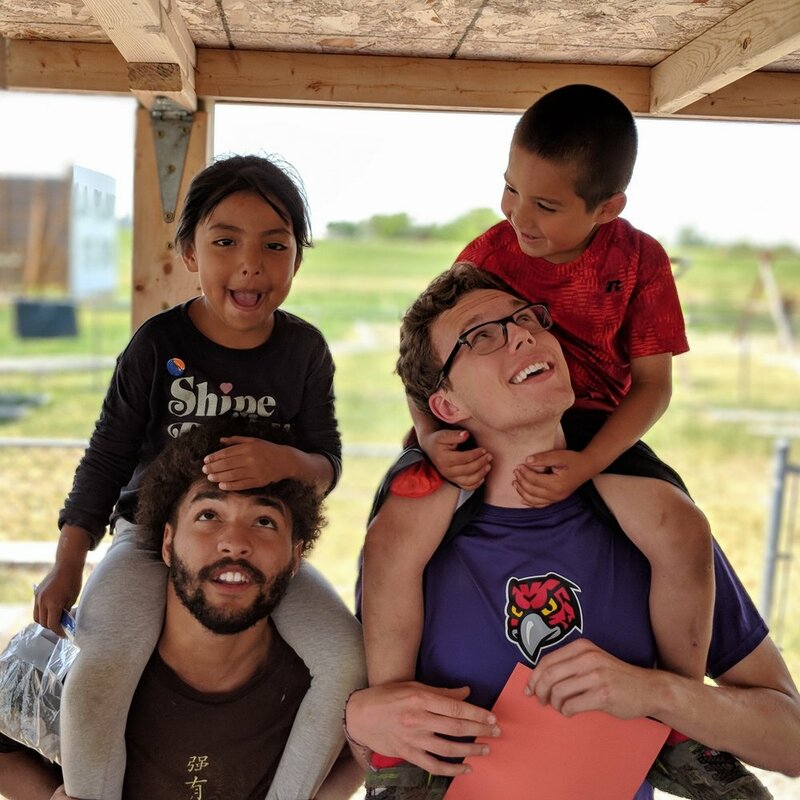 In a place where the poverty is extreme and entrenched — where centuries of attempts to help the Lakota people have failed or done more harm than good — you are here to help us with community programs, summer camp, and more. Volunteers are a vital part of how we provide bright futures for the children in our care. We need you! How long is a Simply Smiles Service Trip Experience? Group service trips to the Reservation with Simply Smiles are week-long experiences. Your team will arrive on Saturday and depart the following Saturday. What should I expect to see and experience on the Reservation? The rolling hills, wide open skies, and sunsets on the Reservation are breathtaking. The landscape can offer insights into the richness and sacredness of the Lakota culture. But, often, the natural beauty stands in stark contrast to the systemic ills of poverty, unemployment, food insecurity, and lack of appropriate shelter that plague the region. During your time spent on the Reservation, you will have the privilege of being welcomed into this beautiful but economically impoverished setting on the Northern Great Plains - and you'll have the opportunity to help make life here better. Will Simply Smiles staff members be with our group the whole time? The Simply Smiles staff will pick your group up at the Rapid City Airport upon your arrival, live and work with your group 24/7 during your service trip, and bring you back to the airport at the end of the experience. The Simply Smiles staff is dedicated to ensuring that your group has an informed, meaningful, and safe experience. The Simply Smiles staff is also trained and certified in basic First Aid, CPR, AED, and Mental Health First Aid. What is the maximum number of participants Simply Smiles can host in a volunteer group? The maximum number of volunteers we can host on the Reservation in one week is 35. If your group expects to have fewer than 35 participants, that’s not a problem at all! Simply Smiles will recruit additional participants for your week. (Don’t worry; we’ll put you in communication with one another before your trip!) Reach out to us and we will do our best to work with you. How far in advance should I book my group’s trip? It is best to book as far in advance as you can to secure a spot with us. Our Volunteer Coordinator, Jasmine Martier, will work with you to find a week that works for you. Click here to jump see available dates. There is no commitment to “pencilling in” a week with us, so don’t hesitate to reach out and start planning your service trip! I need to have the trip approved. Are there resources I can present? Simply Smiles is also more than happy to visit your group (in person or over video conference) to share an overview presentation and do a Q&A. Anything we can do to help get your trip approved, just let us know. We are at your disposal. I noticed that Simply Smiles is not affiliated with a religion or religious order. Why is this? Will going with my church group affect my experience? Simply Smiles is not affiliated with any one religion, faith, or denomination. This is so that we can be approachable and effective with every person in need and so that we can partner with every type of group. With this said, more than half of our volunteer groups are from faith groups. But we have a strict policy forbidding evangelizing or proselytizing in any manner (this includes "vacation Bible schools.") We believe that the most powerful way to share the universal tenants of your individual faith or beliefs is to live a life of example and good works. Doing so will have a powerfully positive impact on everyone for whom you are traveling to support. We know that this is a complicated subject that can be a sensitive. If you have any questions, we encourage you to contact us at any time. How is this service trip not “voluntourism”? Simply Smiles is committed to working in concert with the indigenous communities at our program locations on the Cheyenne River Sioux Tribe Reservation in South Dakota and in Oaxaca, Mexico. We have formed successful working partnerships with these communities that are built on mutual respect and trust. Together, we are working toward a defined and common goal. Visiting volunteers are included in this partnership and are vital to this pursuit. The Simply Smiles volunteer experience is crafted so that you are offering help that is desired, needed, and can’t easily be offered by the local population. During your service trip experience, you will not be a tourist, an onlooker, or a passerby. You will be fully immersed in the culture, in the work of Simply Smiles, in the lives of our partners, and in the vital process of helping to provide the bright futures that every child deserves.